RAY vibratory hammer - Changzhou Raymond International Trading Co.,LTD. What’s Pile Hammer"vibratory hammer" is a tool used to drive piles in or out of the ground for building marine docks, bridges, buildings, roads, rail, walls, and many other types of foundations. 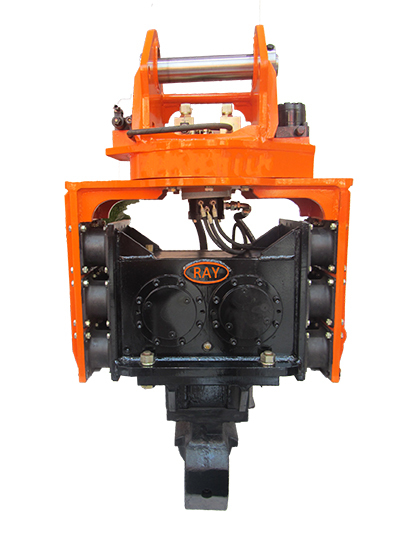 The range for suitable excavator is from 20-40T. The pile length is 9m to 16m. Vibratory pile hammers contain a system of counter-rotating eccentric weights, powered by hydraulic motors, and designed so that horizontal vibrations cancel out, while vertical vibrations are transmitted into the pile. 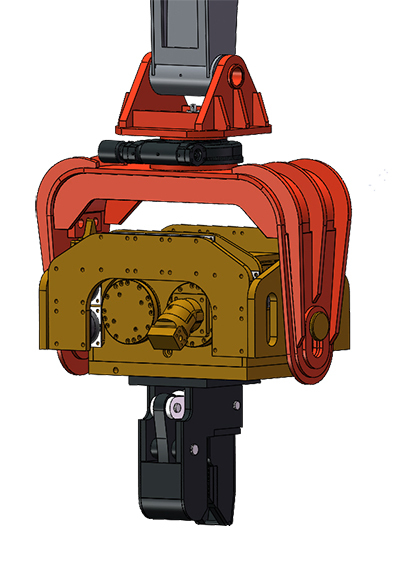 The pile driving machine positioned over the pile with an excavator or crane, and is fastened to the pile by a clamp /or bolts. Vibratory hammers can drive or extract a pile. Why we need the Pile hammer? 1. Save time: The high-speed vibration causes the soil to actually "liquify" and the pile will slip into the ground almost effortlessly. Many would describe using a vibratory hammer like using a hot knife to cut through butter or tofu. 2. Wide application: It can be used for building marine docks, bridges, buildings, roads, rail, walls, and many other types of foundations. Even underwater. 5. Easy to ship: Small size and light weight than traditional pile drivers. The special for our vibratory hammer. 1.Have two series: the one is horizontal type, the other is vertical type. From the structure you can see the horizontal type is much popular than vertical type, as the higher distance for operation. 2. Custom-made for clamping: There are sheet clamping jaw or concrete pile clamping which can be custom-made, the material is Q460 with stress relief annealing. So wear-resisting and long service time. 3. Hydraulic motor: Vibration motor, Parker motor from USA, Rotation motor, M+S motor from Germany, world famous brand. Good and stable quality. 4. Eccentric gear: Alloy steel, with special treatment and grinding treatment. 5. Rubber: We have full rubber to protect the gear box. Generally, the service life of the rubber mounts is 4 months with 8 hours per day. 6. Warranty: we provide 6 months warranty except the wear parts (The wear parts such as rubber and clamping).